I‘M FASCINATED by the midcentury midwest furniture companies. I have this suspicion they were more interested in quality than transient styling. Willett was based in Indiana, and they made some really nice stuff. With real wood. My guy Royal Barry Wills also designed a line of furniture for them…. 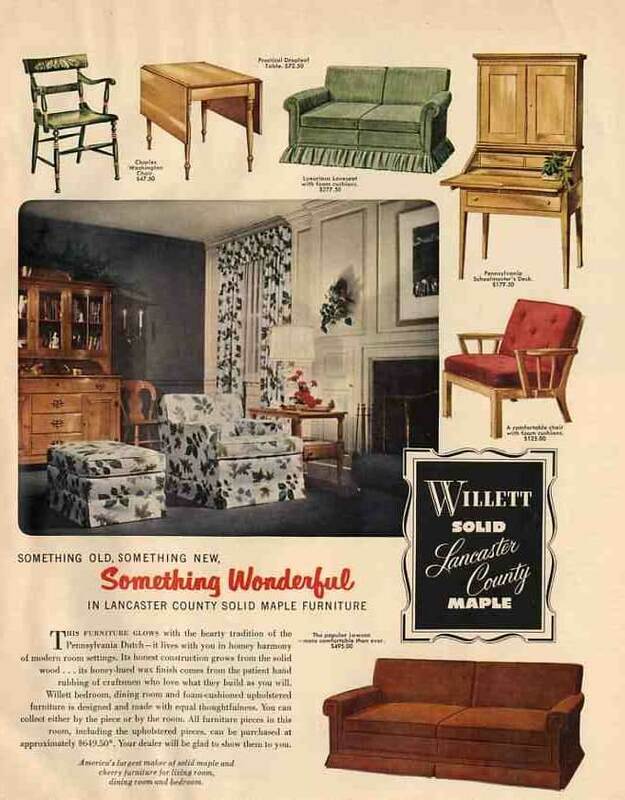 This Willett ad is from 1952…the 40s period was coming to an end…recall, 1953 started The Fifties. Can’t you just imagine how proud a family was when they bought this furniture? The sofa — it’s such a classic. And it was not cheap: $495. That’s $4,014 today! I have a cherry Willett dining table and chairs. The surface of the table has been damaged with scratches and heat. What can I do to repair this? Also the chair seats have lost their springiness even thought the springs are still there. Where can I find the value of my maple slanted secretary?